What is your golf GPA? I created and have been improving the GPA system to better teach golf one day many years ago on the range. 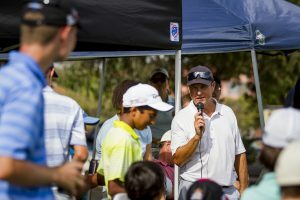 My intention was to develop a phrase or thought that students could remember and it would improve not only their golf but also their mental approach to hitting a shot and playing the game. The GPA system has time tested with proven results. On the practice tee, I can tell the skill level of any golfer, just by how the hold the golf club. It is a sure sign of how one plays golf. The GPA is something everyone can take to the course and it will make them a more consistent golfer! Controlling your ball flight is paramount to you playing consistent golf. Nothing influences ball flight more than how you hold the club. When working with the grip it is important to get your left hand (if right-handed) on the club properly then understanding how the right hand “fits” in and marry's the hands together as one!! Educated hands is a must in good golf. Your GPA is the key to lowering your scores. Let's work together to increase it and then take it from the practice area to the golf course.